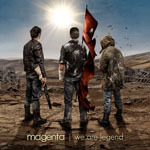 Share the post "Album review: MAGENTA – We Are Legend"
In June 2012 Rob Reed chatted with David Randall for his weekly show on Get Ready to ROCK! Radio when the current Magenta album was ‘Chameleon’. He was also poised to release the major project ‘Kompendium’. They covered Magenta, the earlier band Cyan, and side-projects such as Chimpan-A with tracks from all bands. This is part of The GRTR! Archive series (60:00). I have to admit to having a ‘soft spot’ for Magenta. But Rob Reed’s promise of ‘trying something different’ using a broader musical pallet, combined with the post apocalyptical B-movie cover art, with its obvious symmetry with the Will Smith film I Am Legend, had me worried. But fear not, while Rob Reed may have a bigger paint box at his disposal, he’s still painting by the same numbers. It turns out We Are Legend isn’t so much ‘something different’ as a turning back of the clock to 2004 – 2006 when they produced their best albums – Seven, and Home. While subsequent releases – Metamorphosis, Chameleon, and The Twenty Seven Club have all had high points – somehow they’ve never quite reached the sublime melodic consistency of their predecessors. We Are Legend puts that right – constructed with an OCD like rigour to the format of the classic prog albums of the 70s – running out at 40-50 minutes, with side one having a long epic and side two, two shorter tracks. Bringing in a new rhythm section Jon ‘Jiffy’ Griffiths (drums) and Dan Nelson (bass) to supplement the core of himself, Booth, and Chris Fry, it’s nevertheless apparent that Reed is still calling all the shots. The 26 minute ‘Trojan’, is classic Magenta, and classic prog. Opening with widescreen keyboard soundscapes, it explodes with soaring guitars and Booth’s unmistakeable vocals, echoing both the band’s earlier work and more distantly, shades of Steve Hackett, Yes and Genesis. A gentle, atmospheric, Floydian/Oldfield mid-section provides a bridge to a moving finale underpinned by some exquisitely fluid Gilmour style guitar lines, replete with the unashamed pillaging of some of Nick Mason’s distinctive Dark Side percussion fills. The Floydian influence spills over in to ‘Colours’ (which, in turn echoes Marillion’s Lavender in the construction of the run out section). But it’s another uplifting piece and another perfect vehicle for Booth – the one unique part of the band’s DNA - to shine. ‘Legend’ – a more angular piece, is more redolent of the band’s more recent releases, wears its influences less obviously, and seems somehow less focused and the weaker for it. But like the rest of the album there’s no questioning the craft that’s gone into the production. This entry was posted in ALBUM REVIEWS, ALBUM REVIEWS (Mobile), All Posts, INTERVIEWS, Radio interview, The Best of 2017 and tagged album, interview, Magenta, prog, Progressive Rock, review, Rob Reed, We Are Legend. Bookmark the permalink.